I made this one for my friends little girl. She knit some adorable longies for Hannah and in return I made a dress. She picked out the fabric. 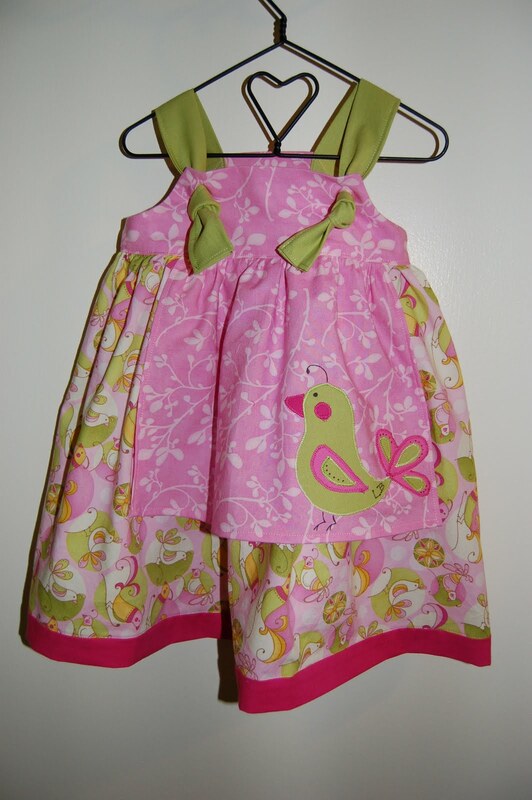 I love it, but I don't really need more fabric so I should stay away from Hawthorne Threads. 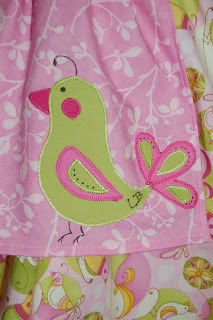 I did the little bird applique to match the birds on the fabric. It was a fun thing to create! I am often reminded why I love to sew when I do projects like this. When I was a little girl I created things out of cut paper all the time. I have vivid memories of making Johnny Appleseed in 2nd grade. Mrs. Bable tod me I needed to be done but I had only started cutting out the squares for his checkered vest! Oh I was mad. I still had to make his pants, shoes, bag, and apples. I started sewing when I was in 3rd grade. I made all sorts of outfits for my dolls. Anyway, I'll save my ramblings for another post. It makes my soul happy when I get to create. That's why I sew.